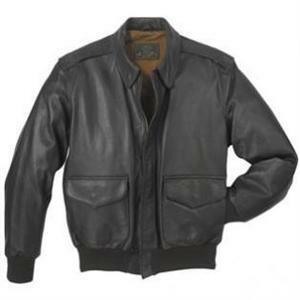 Cockpit USA (formerly Avirex LTD), the prime and only USAF government contractor for Air Force issue flight jackets now offers the updated current 21st century version of the classic A-2 Air Force pilot's jacket, made out of the same luxurious Mil. Spec. government goatskin as earlier A-2 versions. The Air Force life support division listened to their pilots' requests to modify the 1987 version of the A-2 to accommodate current needs. This jacket now offers a host of new features which do not detract from its authentic appearance but provide the user with modern day conveniences. These include hand warming pockets, underneath flap pockets, inside pockets for personal equipment and a special pen pocket inside to allow pilots access to these articles. These jackets are roomier so order your regular size. Proudly made in the U.S.A. Available in regular and long sizes.